Just playing with the only available millet/Foxtail millet. One or the other day i cook Millet/Foxtail Millet in any form. 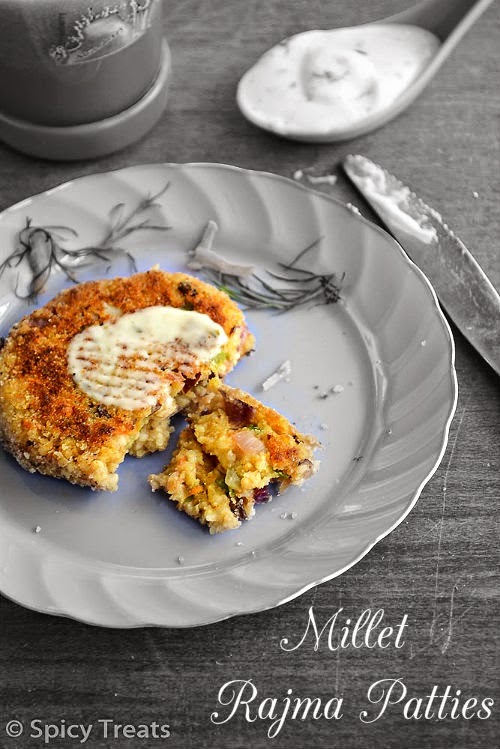 This time its Millet Patties / Millet Patties with Rajma or kidney beans. 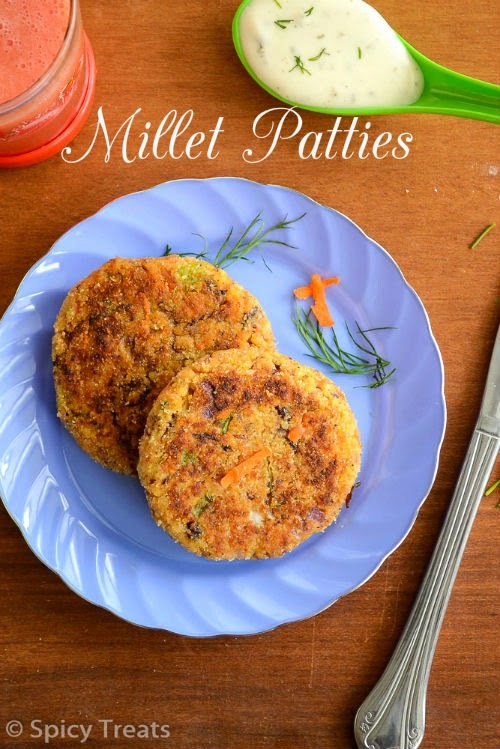 These millet patties are so easy to make, healthy, gluten free, vegan and perfect for a guilt free low calorie snack. 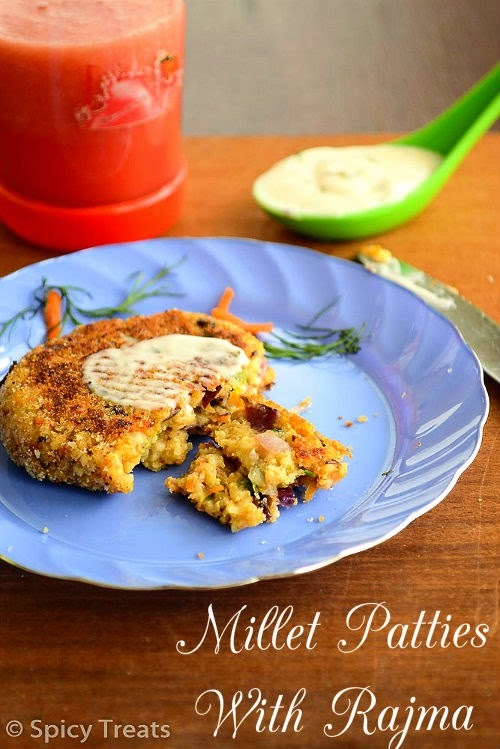 These vegetarian Millet Bean Patties makes a perfect after school snack for kids. My kiddo loved these patties with his favorite Garlic Ranch. Wash and soak millet in enough water for 5-10 minutes. Meanwhile in a saucepan add 1.5 cups of water and bring it to boil. Once it starts boiling add the drained millet and cook in medium heat for 5-7 minutes. Millet get cooked faster than rice, so 5-7 minutes is enough. If you feel water is high then increase the heat to medium high or high and cook without lid till all water is absorbed and millet get cooked. After that allow the cooked millet to cool for a while. In a processor or blender, pulse cooked rajma for few seconds and keep ready. Now in a wide bowl, add cooked millet, mashed rajma/kidney beans, finely chopped onions, capsicum, ginger, cilantro and shredded carrot and enough salt. Mix well, and add corn starch, paprika, breadcrumbs and mix well. If you feel the mixture has more moisture then add one more tsp corn starch and couple of tbsp of breadcrumbs and mix well. Then divide the mixture into 12-14 ping pong ball sized portions. Heat a tawa/griddle, smear with oil once it is hot, take one ball, flat it between palms and dust it in the bread crumbs and place it in the tawa, drizzle oil over it. Based on the tawa size, add 3-4 patties at a time. Cook in medium heat, after 2-3 minutes flip other side and cook for another 2-3 minutes. Lastly bring the patties to the tawa edges and cook the sides of the patties. Once done, serve the Hot and delicious Millet Rajma Patties with ketchup or desired dipping sauce. Use any desired millet or you can use Quinoa also. Instead of paprika you can also use chilli powder or any curry powder. Adjust pepper to your taste, taste the mixture before making patties and add salt and spices accordingly. You can also refrigerate the patties for few hrs and use it. The refrigerated patties holds the shape well. 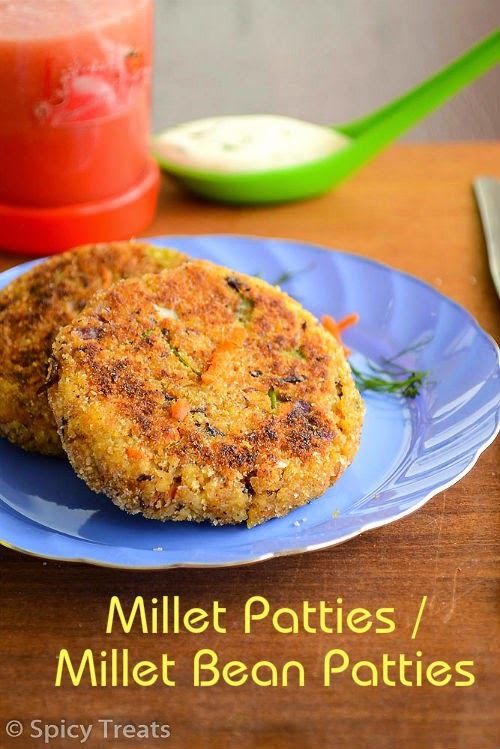 Love that these patties are made with millets and they are gluten free.. Who will say no to it. Well nutrition recipe.. lov to try it out soon..
A healthy alternative to potato binding.i guess we could use chickpeas as well.looking colorful as well. 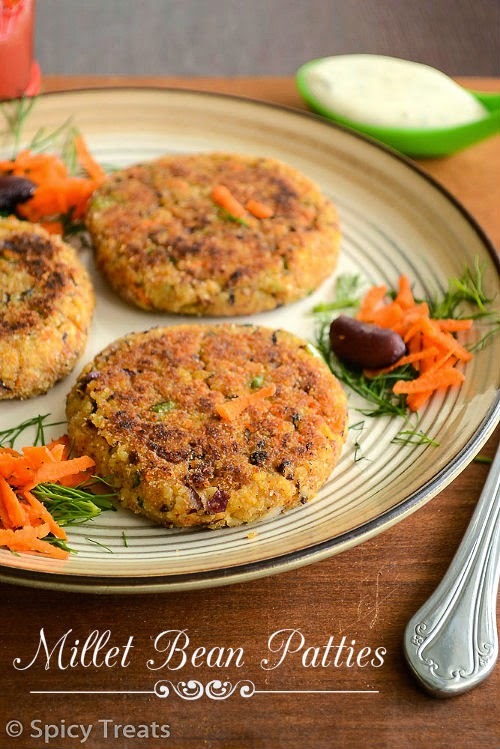 healthy meatless patties sangee, must try!! !